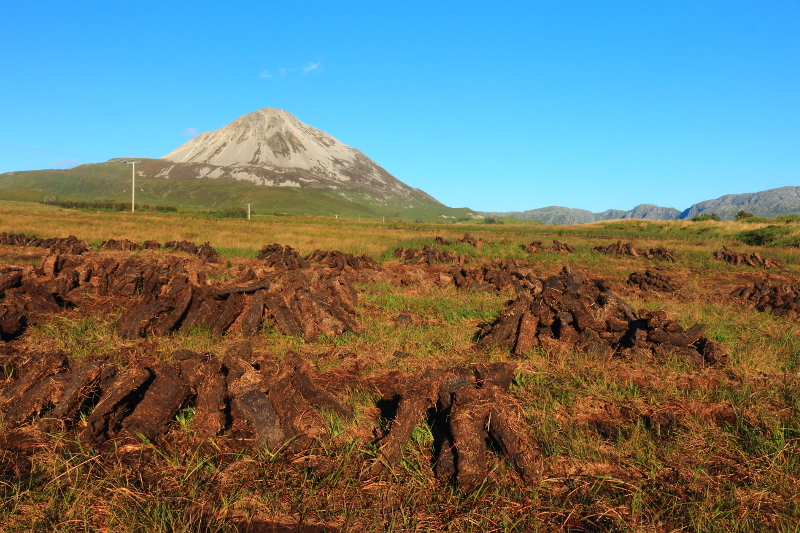 Mount Errigal from the west – a makeshift bridge giving access to the bog and the drying turf, which will be used for fuel, in the foreground. 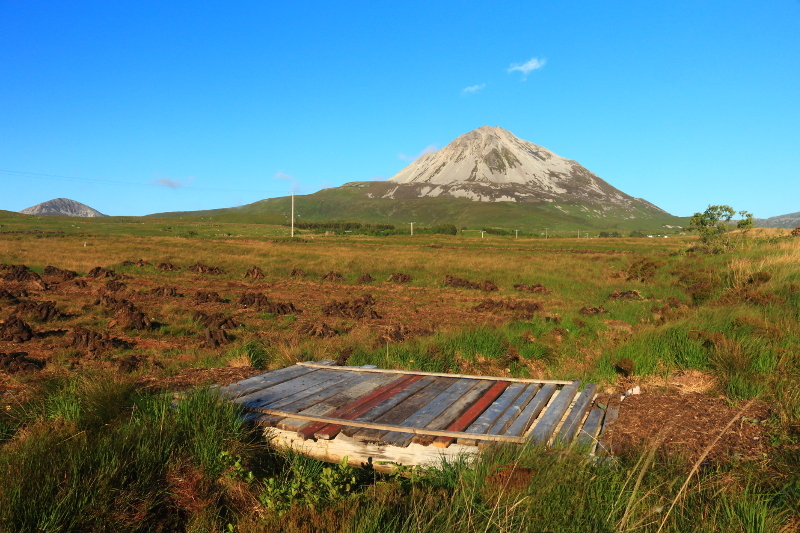 Mount Errigal, at 751 metres high, is the highest peak in the Derryveagh Mountains range, and Co. Donegal. 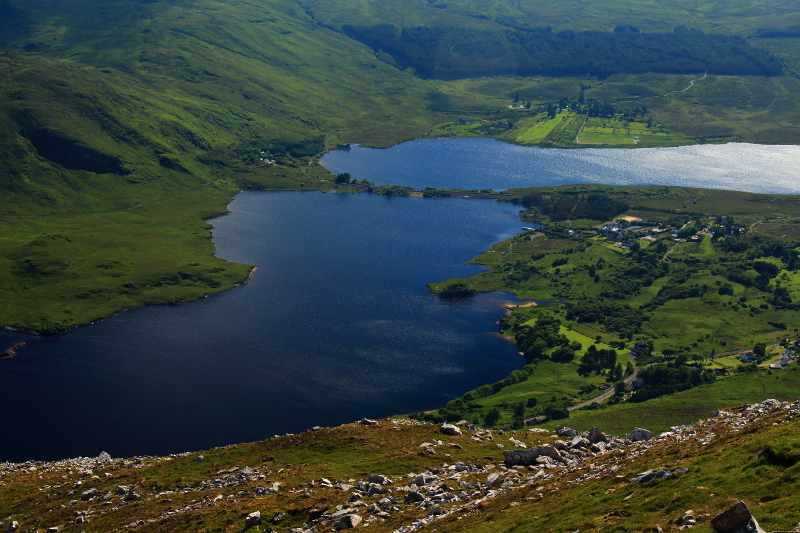 It is a special mountain, often topping polls among hill walkers in Ireland as their favourite walk. Its profile changes depending on the viewpoint, and its concial top, covered in quartzite rocks, changes colour with the light. 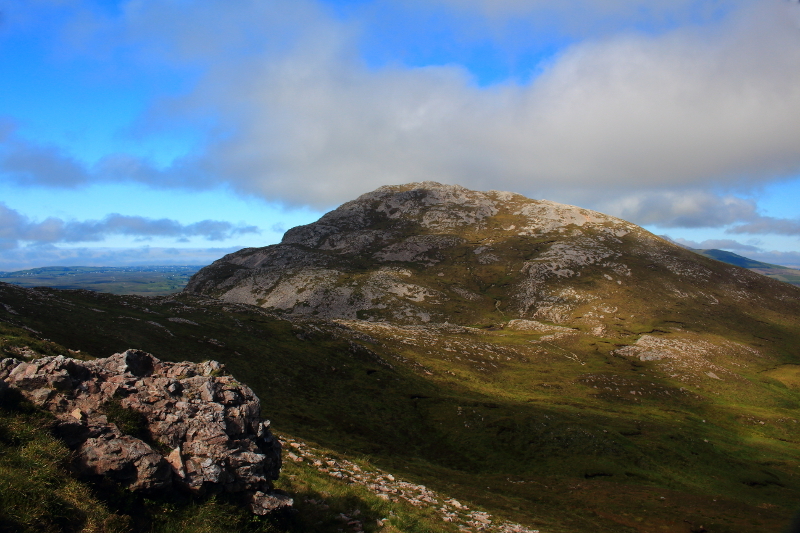 I have often admired it from below as it dominates the whole area of northern Donegal. 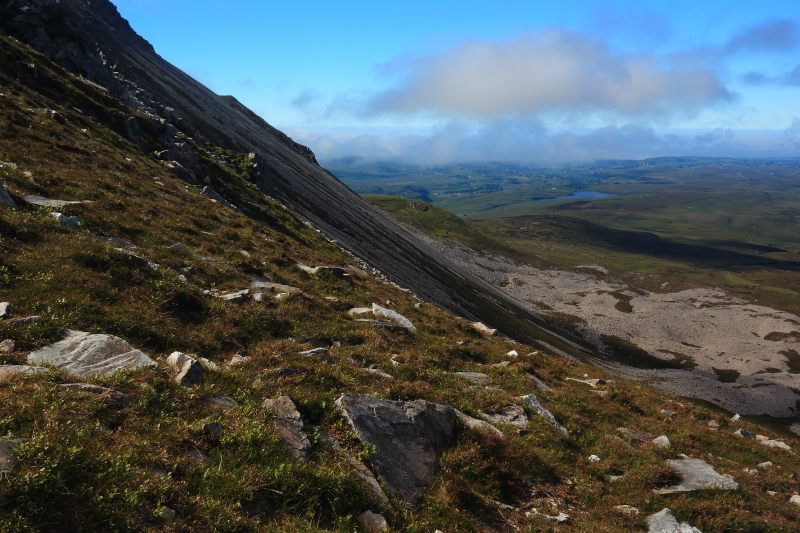 It can be seen on the horizon from even farther afield, and since I have started hill walking, I have often seen it from afar on distant peaks in Tyrone and Derry, promising myself that I would climb it soon. 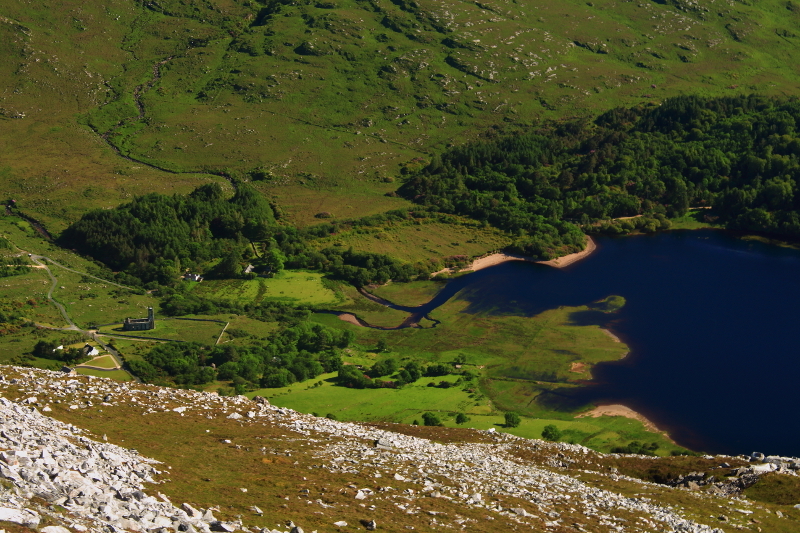 I had resisted the temptation many times, waiting for a day when I could be as sure as possible in Ireland, that the weather would be clear enough to enjoy what I knew would be spectacular views. 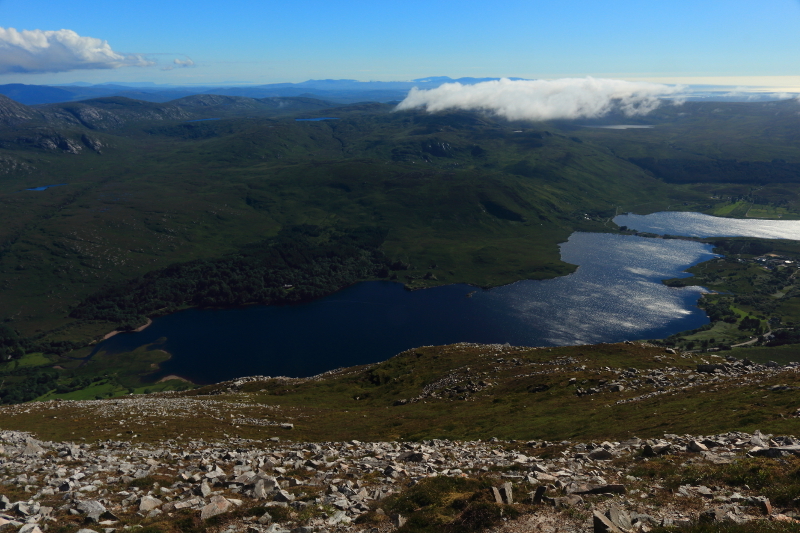 On a bright June day, the conditions seemed perfect, coinciding with some free time, and I set off to achieve a long held ambition to stand on its summit. I had been so looking forward to it that it almost felt like a quest. 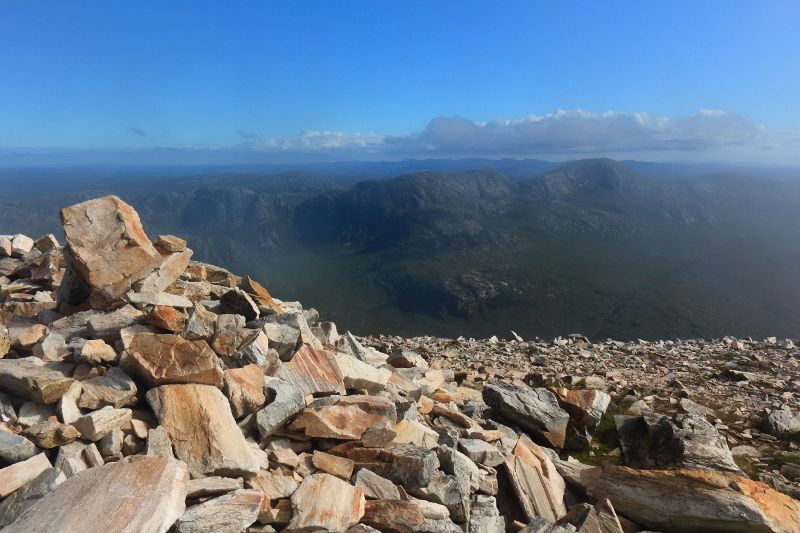 I decided to take the most common route, from the car park on the R251 road, on the southern side of the mountain. 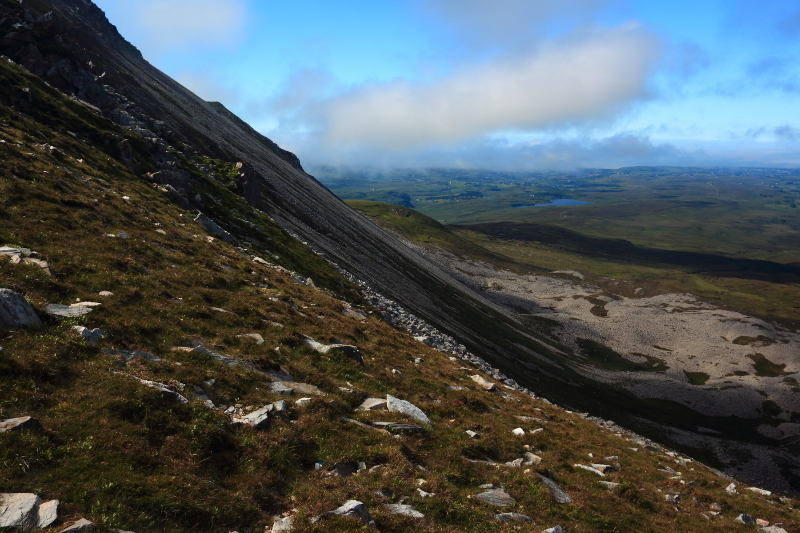 On the lower slopes, below the quartzite cone, the terrain was fairly boggy, but not too steep at this stage. 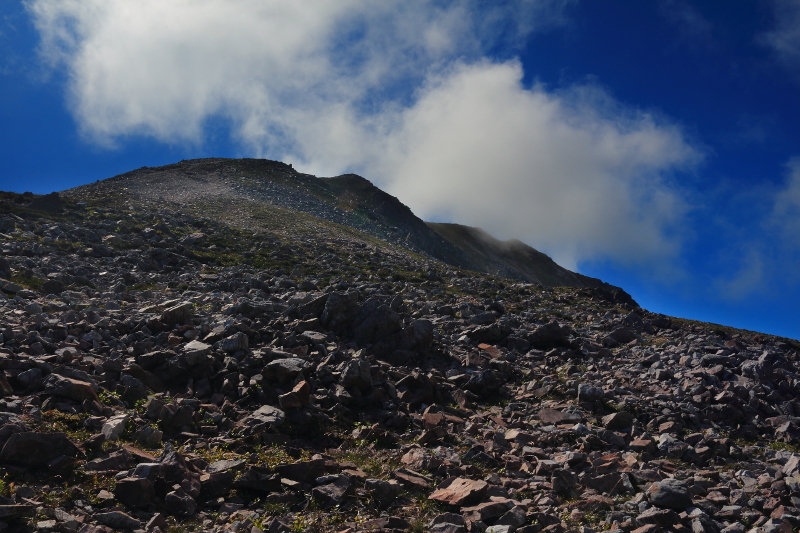 Soon after starting out, looking up the southern slopes. 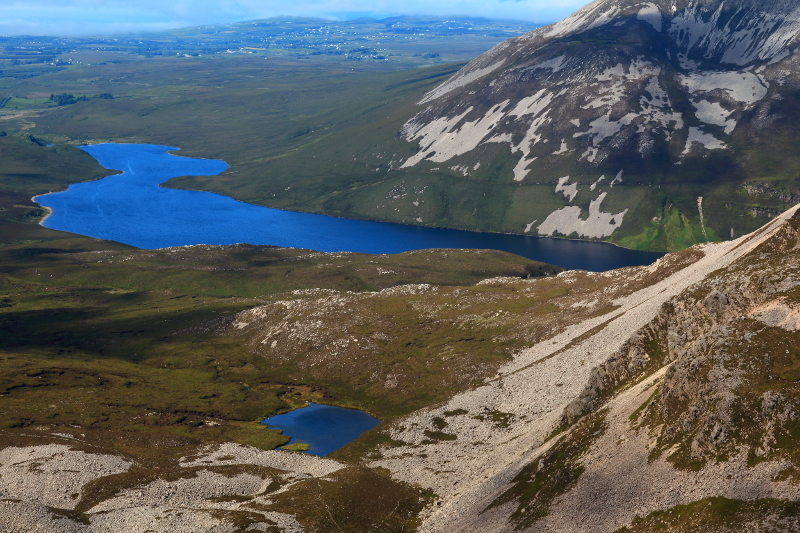 With only a little height gained, I was already captivated by the views, in this case towards Errigal’s smaller neighbour, Mackoght. 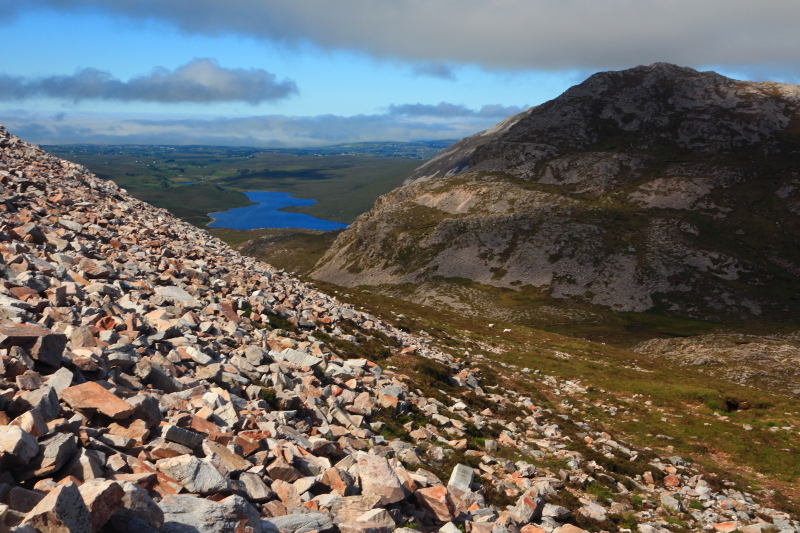 A little more height, and I was beginning to enter the quartzite rubble, which together with its shape, makes Errigal so distinctive. 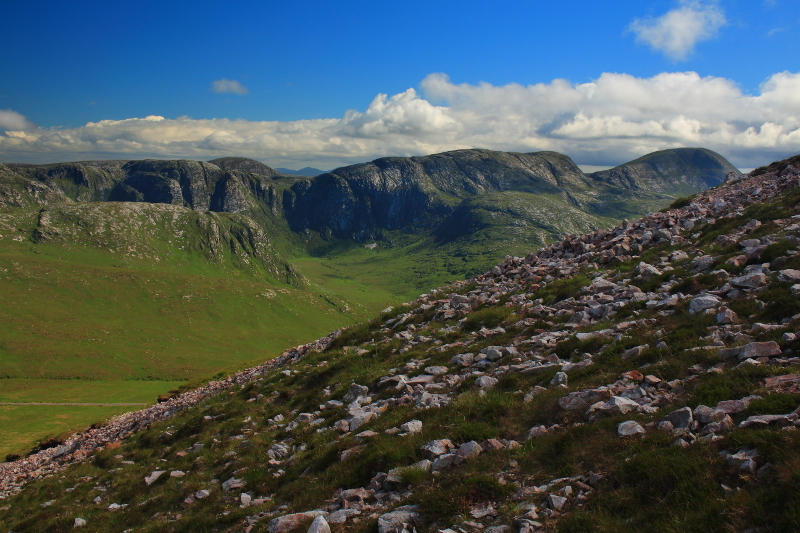 The backdrop is the main Derryveagh range. 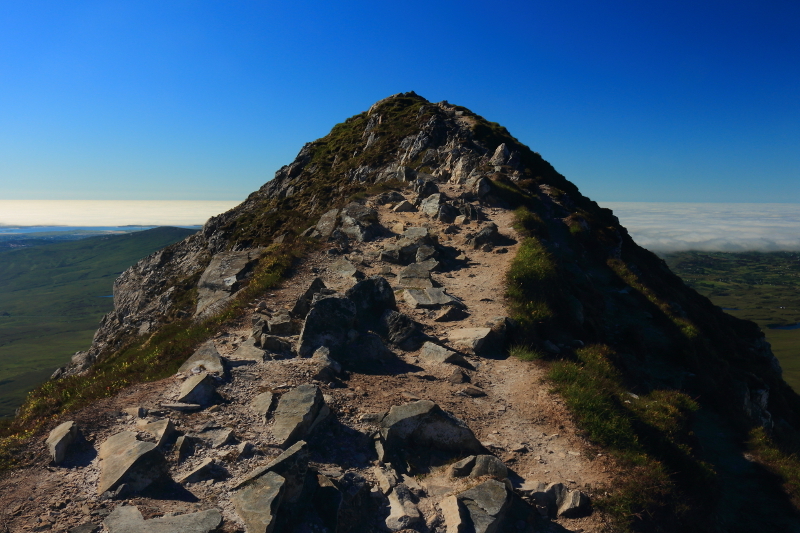 Another look up to the summit, just being skimmed by the clouds. Well into the quartz now! I was really enjoying this unusual landscape. 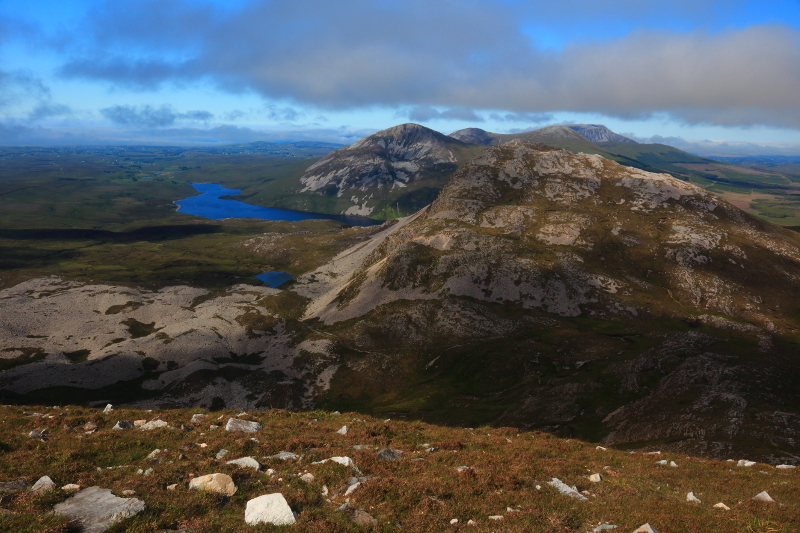 I have enjoyed every hill and mountain I’ve walked, but Errigal is definitely something special. Another look east to Mackoght. 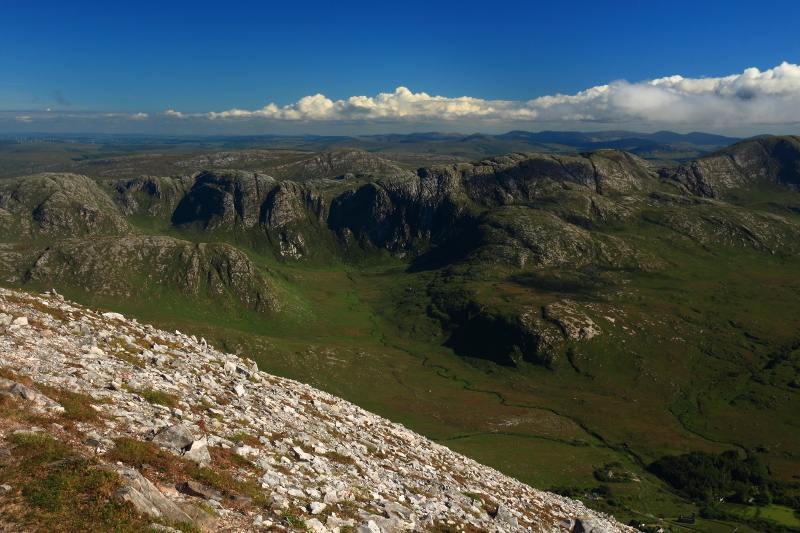 Behind Mackoght, Aghla More makes an appearance, with Muckish just visible beyond that. 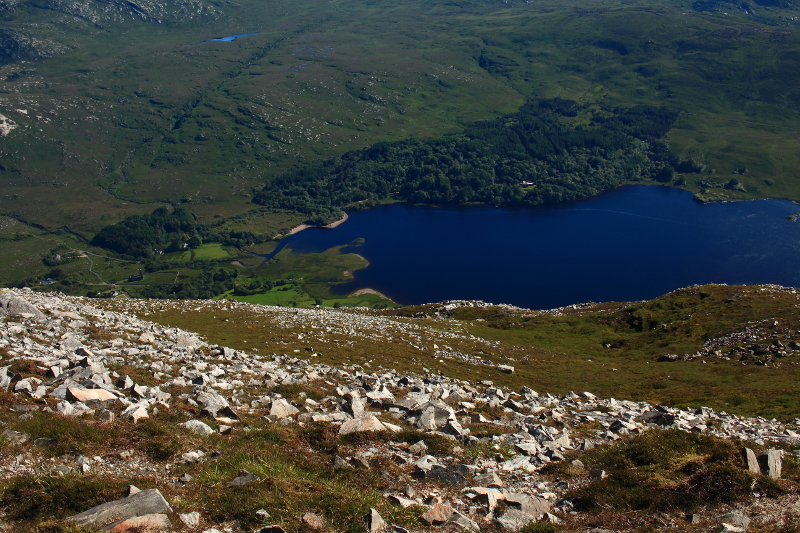 Aghla More dropping down to Altan Lough. 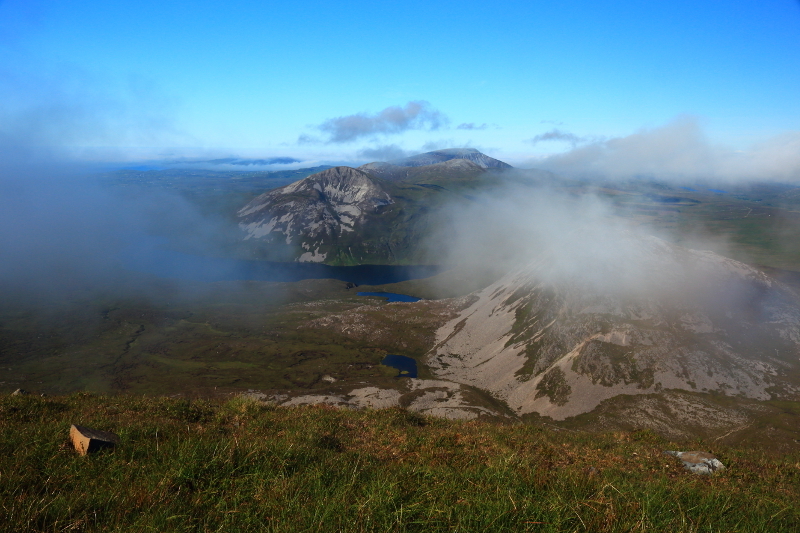 I was now well up the mountain, and cloud began to move in around the higher ground, beginning to obscure the views below. 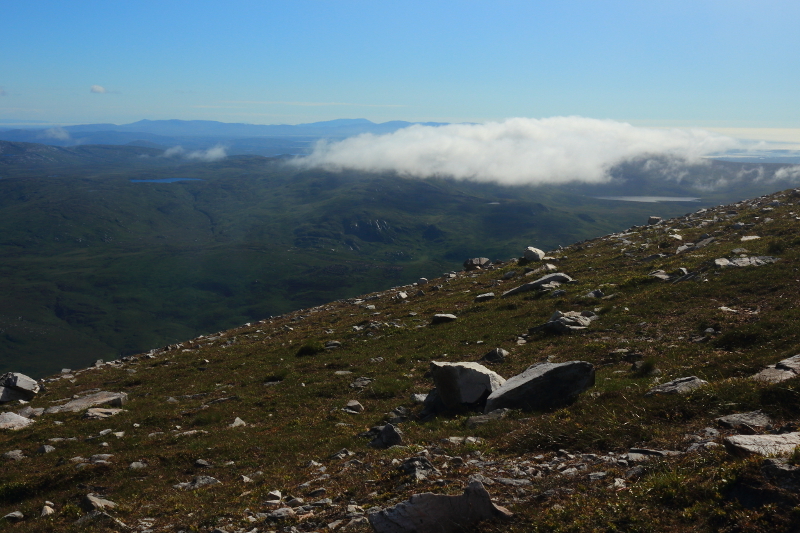 After some fairly steep ground, I now found myself on a flatter section, clouds still making themsleves felt, thickening and thinning again by the minute. 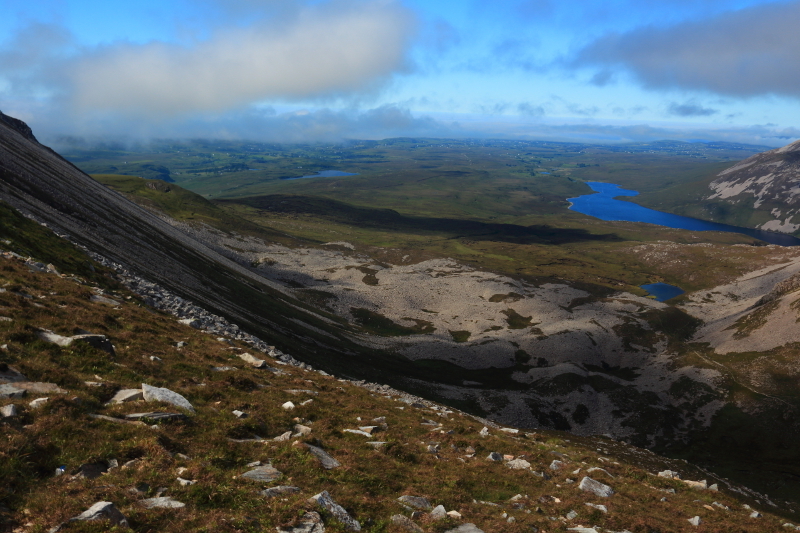 This was a flat area, but there were steep drops on the eastern side. Looking backwards to the valley I had started from. 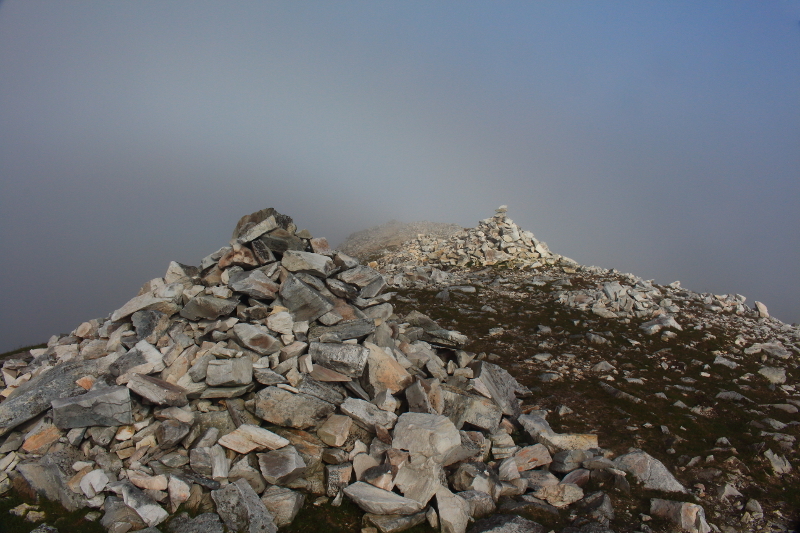 A large cairn, with thick cloud now, behind. Looking west where thick banks of cloud and fog obscured the Atlantic. 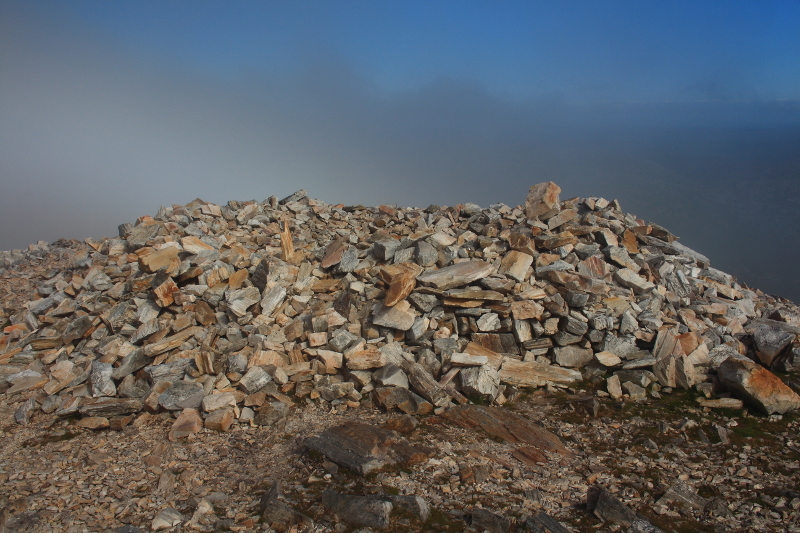 This area had several large cairns, providing interest as cloud hid the wider views. 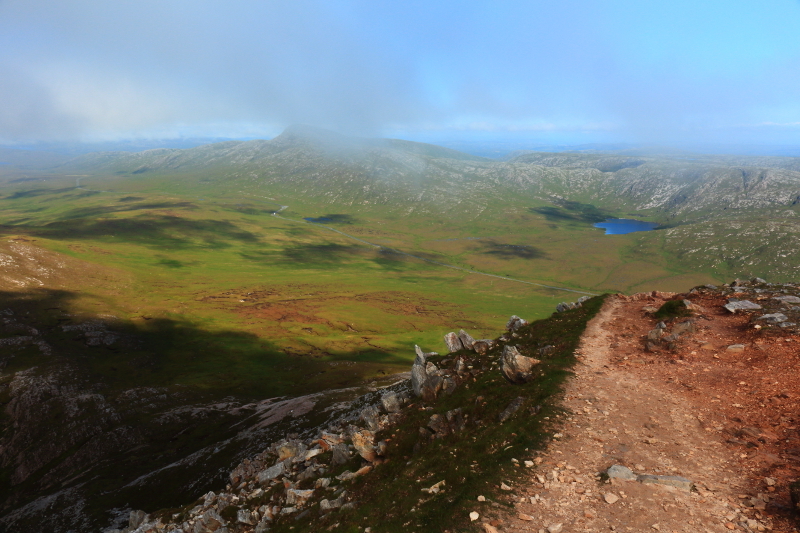 Looking directly down through the cloud to Lough Nacung. 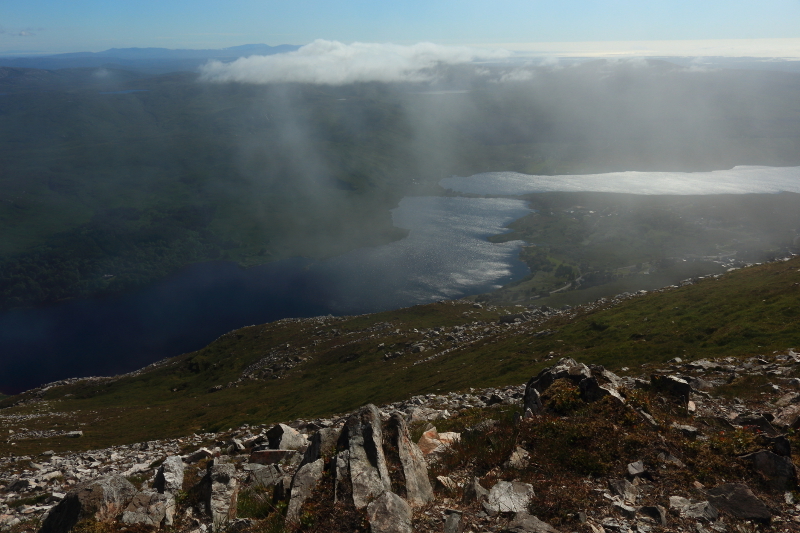 The cloud clearing, giving better views of Lough Nacung. 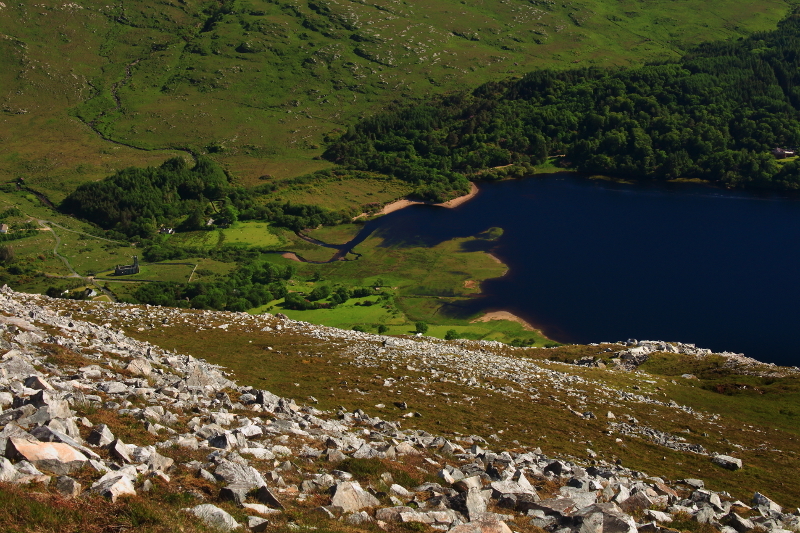 Zoomed in on the western end of Lough Nacung and Dunlewy. 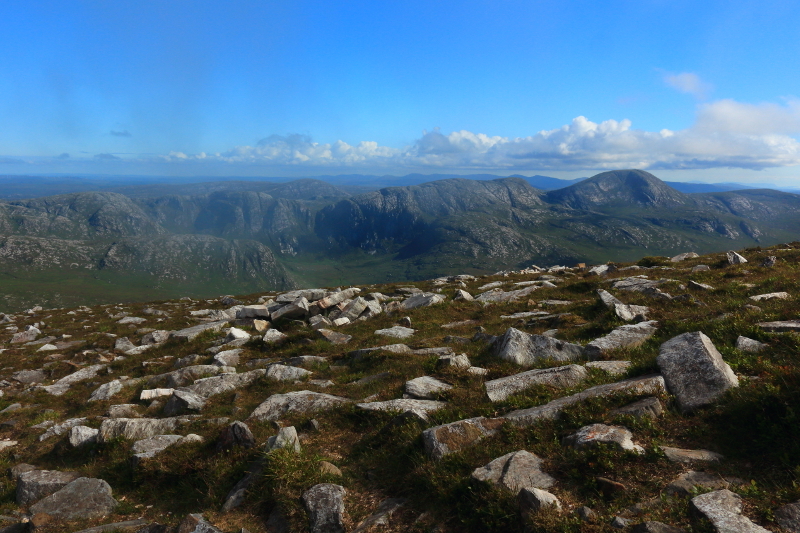 The clouds had by now completely cleared, offering magnificent views in all directions as I neared the summit. 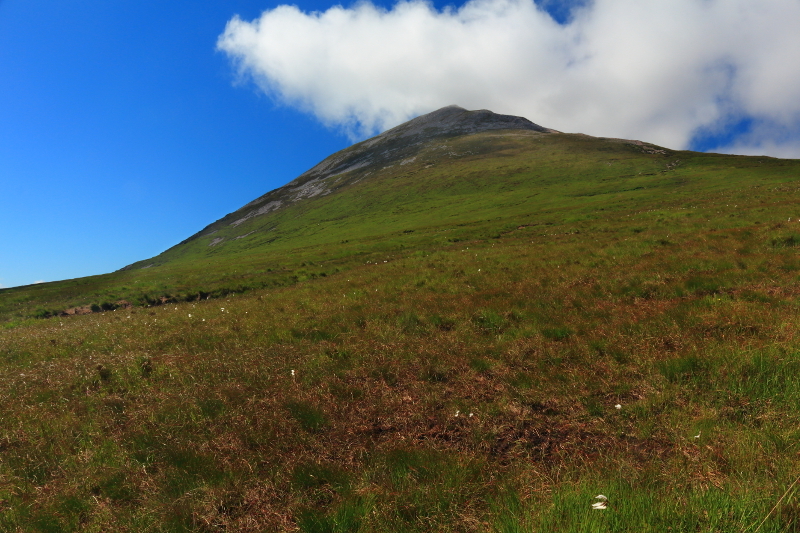 The summit, now within touching distance. 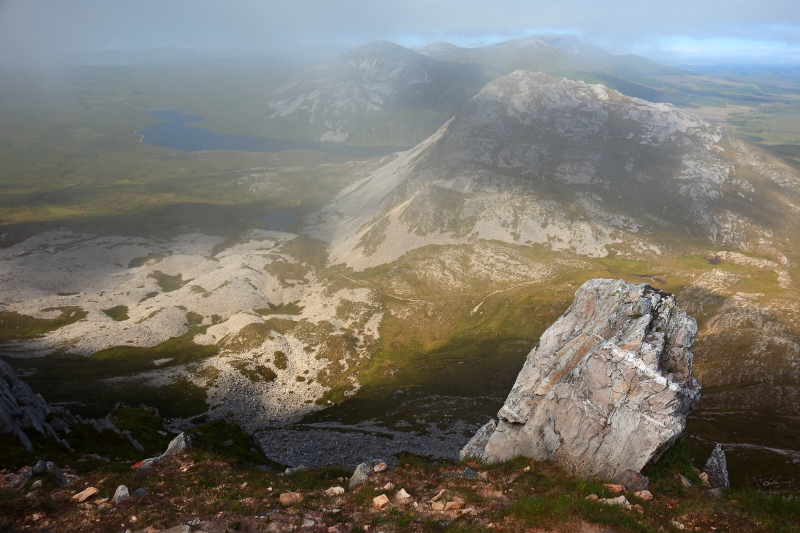 It is difficult to explain the feeling I had, a mixture of excitement and calm contentment, that I was about to stand on top of this mountain which I had so often gazed in wonder at. 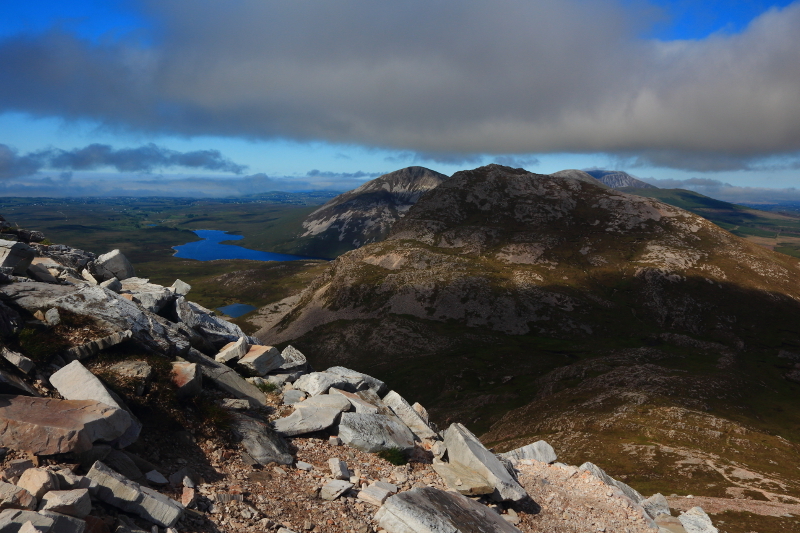 After taking the last few steps to the top, as you can imagine, I lingered for a long time, taking many more photographs. 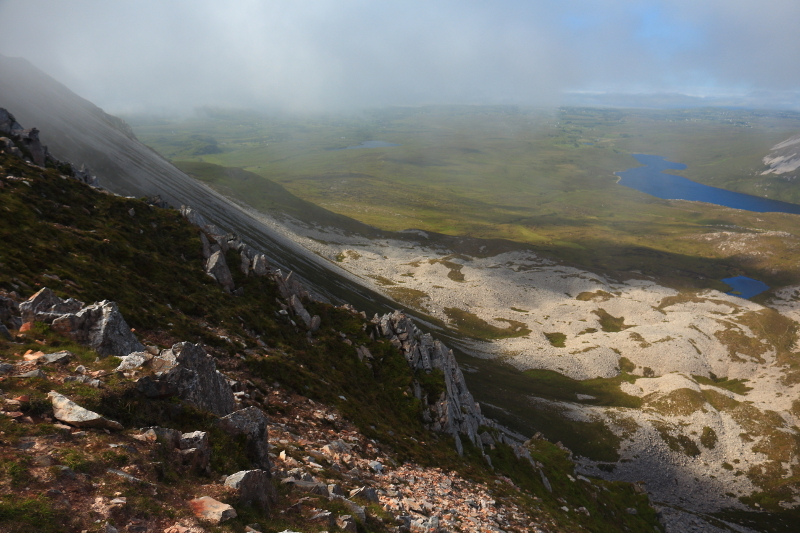 Too many for one post, so I will continue my day on Errigal in a second post to follow soon. 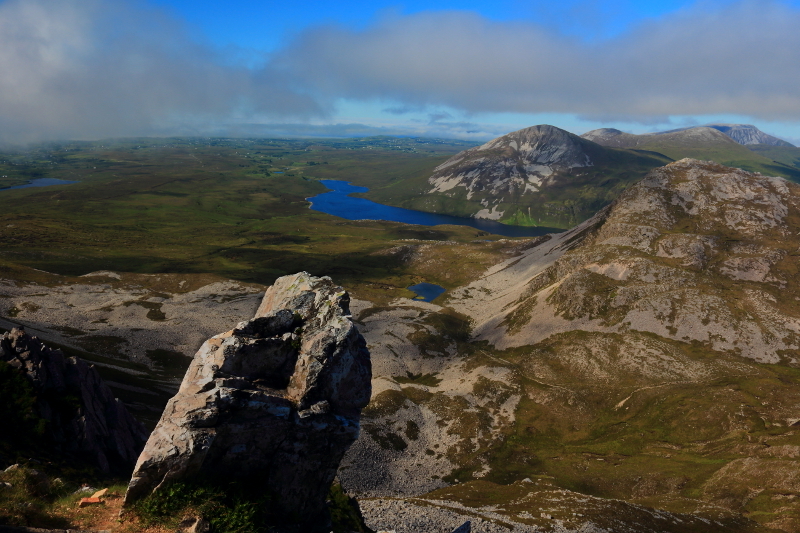 Posted in Landscape, Nature, PhotographyTagged Co, County, Derryveagh, Donegal, Dunlewy, Errigal, hill walking, Ireland, Lough Nacung, Mount, Mountain, mountainsBookmark the permalink. Spectacular views, Adrian, and a most unusual mountain. It looks like the conical outline of a volcano from a distance. 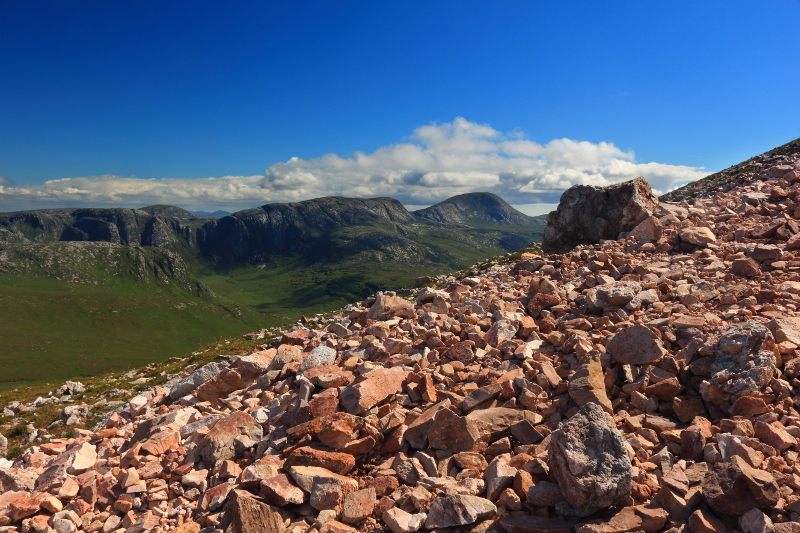 I expect all that quartzite shimmers in the sunlight and can be seen miles away. You must have got a great sense of fulfillment when you reached the summit. Thanks Jessica. 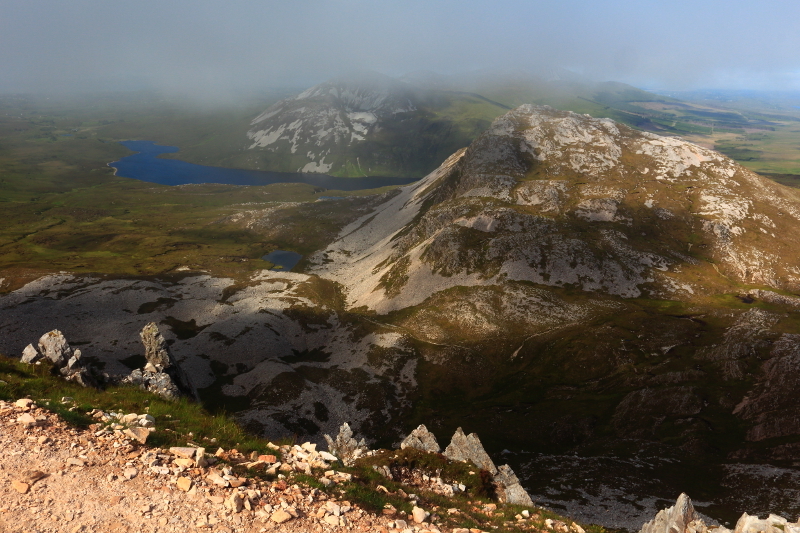 It does catch the light, and even though I’ve been on higher mountains, there is something intangilbel about Errigal that made it special.